For those unaware, the Miami Marlins owners were ragging on the Red Sox yesterday for their spring training lineup, because when you know your season is already over, this is what you do. Hey Miami, you mess with the bull, you get the horns. I’d say we’ll see you in October, but we both know that’s not going to happen. 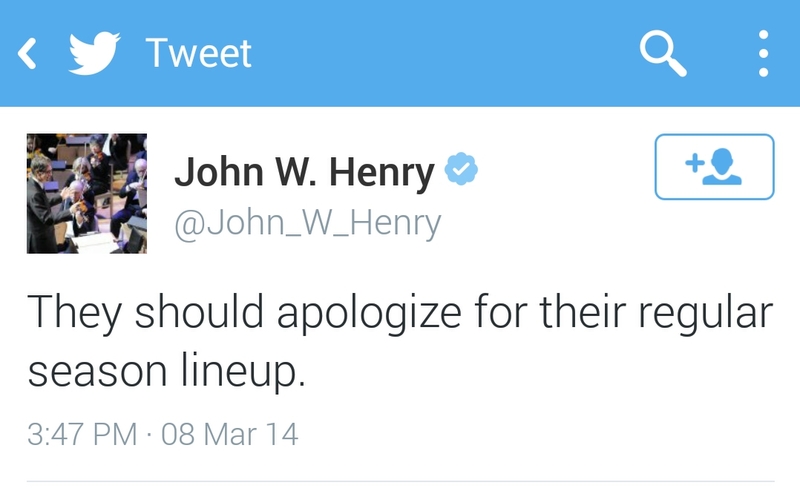 Posted on March 9, 2014, in Average Blog Posts and tagged Boston, Henry, john, lineup, marlins, miami, red, sox, spring, training. Bookmark the permalink. Leave a comment.